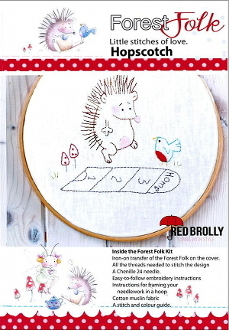 Red Brolly Kits have nearly everything you need to create super cute projects. Design features a Hedgehog playing hopscotch amongst the toadstools, while Bluebird awaits her turn. Kit contains: an iron-on transfer of the cover image, all threads required to stitch the design, a needle, a piece of muslin fabric, and instructions. Embroidery hoop is not included.